Pfalz Flugzeug-Werke GmbH first got into the fighter business in 1915 with their Eindekker. The airplane was based on the Morane-Saulnier Parasol series, with the wing moved down to the upper fuselage, similarly to the better-known Fokker Eindekker. Heavier than the Fokker, the Pfalz Eindekker was not as good as its Fokker rival; the few that were made equipped units of the Bavarian Flying Corps, Pfalz being a Bavarian company. Being "the best second choice" would be the role Pfalz fighters would play for the rest of the war. The D.III was well-liked in service; one of its foremost exponents would be Rudolf Bertold, commander of Jasta 18, who liked the airplane for the fact that its throttle was on the control stick, much like a motorcycle. Bertold had been badly wounded and his left arm was nearly useless; with the throttle in this position he could fly the airplane much better than he could one with a traditional throttle placement on the cockpit sidewall. Eduard may have started its existence as a manufacturer of limited-run injection-molded kits, but that has not been the case now for the past two years. Eduard has become the "Tamiya" of World War I modeling, producing finely-molded kits with sufficient detail to provide a good starting place for World War I modelers, who are generally more involved with advanced modeling techniques. The recent kits are fine straight out of the box, and this Pfalz D.IIIa kit is no exception. 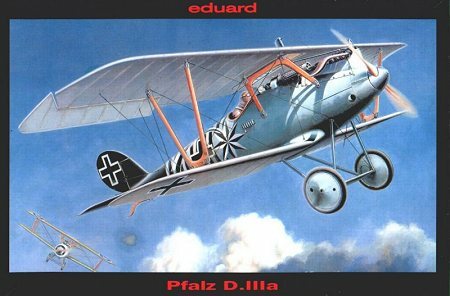 Eduard released the earlier Pfalz D.III as one of its first "new mold process" kits back in late 1996. Checking this kit with the D.III model sitting on my shelf demonstrates that this is a new-design model. This release is the simplified kit, with no photo-etch detail parts. Even so, there is sufficient detail here to make an excellent representation of the real thing as an "out of the box" build. The rib and fabric effect on the wings is particularly noteworthy for its more-accurate restraint, as compared to the "hills and valleys" some people seem to think a fabric-covered wing resembles. The model is simple; for those who have considered building a World War I model but have held back due to the difficulty of construction with a limited-run kit, and the further effort needed to rig the model, this Pfalz D.IIIa would be a good "first kit." It is at least as simple as any of the easier World War II-era models, and the rigging of the airplane was considerably simpler than other First War designs. The airplane also saw almost all its service in a basic paint finish of overall "Silbergrau," a slightly-greyish overall aluminum paint, which makes finishing the model easy. The model looks to be a good "weekend project." Decals provide two marking schemes: the well known D.IIIa flown by Ltn. Max von Holtzen of Jasta 16, and another D.IIIa of the Bavarian Flying Corps' Jasta 30. This airplane is also well-known in World War One circles for its orange tail markings. Eduard has provided a set of their vinyl "express masks" to allow the modeler to get the right shape for this marking, though you will be left on your own to match the shade of orange used on the fuselage marking. Unfortunately, the decals are extremely difficult to use, at best. Eduard used to use Propagteam decals, which have a reputation for sticking like glue to the first thing in sight, but can be dealt with if applied carefully. Recently, they have had their decals printed by MicroScale, which offer no problems. However, a test of the new Polish decals in this kit reveal that they not only stick like glue to the first thing in sight, they stick like cyanoacrylate glue, and will pull apart if an attempt is made to move them once on the model! 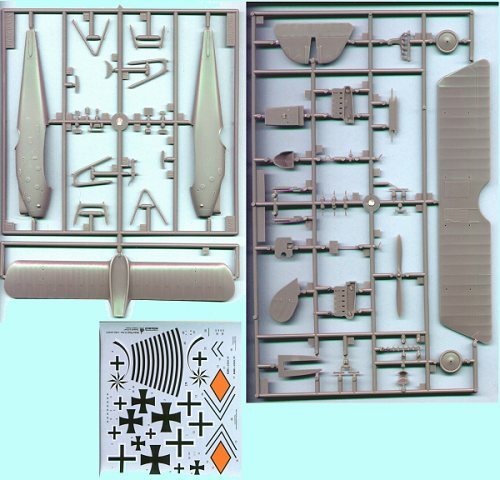 On the basis of this experience, modelers are well-advised to obtain either of the Aeromaster Pfalz D.III decal sheets, both of which have D.IIIa aircraft as options. Otherwise, unless a modeler is *extremely* careful with these decals, the air is likely to turn purple over the modeling bench when it comes time to finish what is otherwise a truly excellent kit. When contacted about this, Eduard representatives told this reviewer that they had recently discovered that the decals produced for the kit were not the same quality as those provided for their original tests, and that they will not be dealing with this company in the future. Unfortunately, this still leaves you, the modeler, with the option of trying to use nearly-unusable decals or buying the Aeromaster sheets."